Did you know that you can get the best burn treatment right from your kitchen? Yes! Honey! What honey can do as a burn treatment has always been head knowledge until I had to unfortunately experience it myself. Testimonies about honey as a home remedy for burns from honey enthusiasts have always left me dumbfounded with amazement, and then now after beholding what honey could do for scalded skin, I had to affirm "What has been said is really true!" While I was so wowed by the fact that nature had bestowed upon us such an extraordinary medicine, I was also dismal that science was so slow in catching up with the health benefits of honey. Perhaps, that is why Joe Traynor in his book, Honey, The Gourmet Medicine, refers to honey as "a medicine without a profit". The first incident happened during dinner time while I was ladling boiling soup into a bowl. Carelessly, I swirled the bowl slightly, causing a few drops of the soup to fall unto my right palm, and because I was so startled by the unexpected hot sensation, I jolted and caused more spillage of the soup on my entire palm. My very first instinct was to put my scalded hand under the running tap. The pain set in instantly and quickly became excruciating. In a frenzy of anxiety, I raced to grab a tube of burn cream from the fridge and apply it on my palm. In spite of that, the pain became even more intense, and my palm turned red. That was when I was reminded of honey as a burn remedy. Frantically, I washed off the cream and took a teaspoon of honey from the jar to spread on my palm. With this, a warm sensation came on the skin. In no more than five minutes, the throbbing pain left! After leaving the honey on for about half an hour and then washing it off, my skin initially felt some numbness, but everything else returned to normal very quickly. There was not a sign of burn on my palm; neither blisters nor redness. I was perfectly well! Subsequently, I had several other experiences of hot cooking oil splattering on my arms and being burned by super-heated pot handles while trying fix dinner in the kitchen (yes, careless me), and every time honey worked like magic to literally save my skin. I still remember that the most serious burn was caused by a claypot that was boiling over. So acute was the pain on a few of my fingers that my tears could not stop flowing and my arms would not stop shaking. The pain was so immense and lasted so long that I was not even sure if the jar of raw Thyme honey (which was the nearest bottle I could reach) would be of any good. Nevertheless, I smeared some of it on my injured fingers and bandaged them. After three to four hours, I removed the bandage and found no swell or damage on the skin. Other than feeling a tinge of soreness, everything was back to normal. What a miracle! 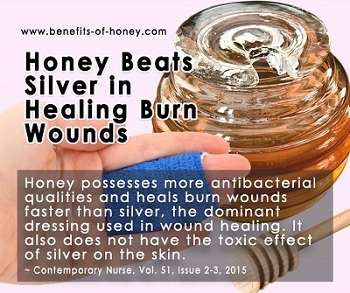 Many years after these episodes of getting burned, it is very exciting to read about the clinical research report by the Contemporary Nurse (Volume 51, Issue 2-3, 2015) that honey is even better in treating burn wounds than silver, the dominant antibacterial dressing. It was found that not only does honey have more antibacterial qualities and heal burn wounds faster than silver (measured in the number of days needed for wounds to heal), it also does not have the toxic effect of silver on the skin. 1. Amazing testimonies on honey as a burn cure: How to Treat a Burn, Honey? 2. Know how honey promotes healing effectively: How Honey Fights Infection. Any Thoughts of Honey as Burn Treatment? Postings on "My Thoughts on Honey as Burn Treatment"
Note: Please give your posting some time to be moderated. Only posts relevant to the topic will be published on this page. Postings are not made to work automatically due to spamming concerns. Used raw honey last night and totally worked! I grabbed a hot pan handle and the pain was excruciating! Ran my fingers under cool water for about 5 minutes and then washed it with mild soap. It was still painful but after pouring a generous amount of raw honey on fingers, I felt some relief. I kept my fingers in a little cup of the honey for a couple hours. I felt a blister forming but after leaving honey on just overnight with a gauze dressing and a sock over my hand, the blister never developed. Amazing! I don't even feel anymore pain. I can kind of see the shape of the blister but it's flat! It kind of feels a little numb. So amazing! As a red head and fair skinned child I wish I knew the benefits of honey when I got hellacious sunburns. As an adult and mother to a fellow red head and of course fair skin honey is my savior. It takes the heat out of the sunburn and no peeling. Definitely works and I tell everyone I know. I must say it HAS to be raw organic u filtered for best results. It works in wounds that aren't burns just stay away from the outside during application or wearing-since it is a sugar-it will attract pests. I used honey on a fairly severe burn on my right forearm. I kept honey on the burn with a sealing bandage and put fresh honey and a fresh bandage on the burn every day. Not only did the honey completely remove the pain from the burn, it healed the burn so completely that it left no scar at all! It is truly miraculous. Honey will definitely cure bad abscess. Matthew, for best efficacy, raw honey is recommended. Raw honey may not be more expensive than pasteurised honey. Liquid and creamed honey are all fine. Both note that both liquid and creamed honey can be raw or pasteurised. You may want to know more about the terms used to label honey - natural, pure, raw, cream, liquid, etc. in this page: Frequently Asked Information About Honey. As far as a burn treatment, does it matter if you use raw honey, 100% pure, natural or regular honey you buy at any store (the cheap stuff)? What about spreadable/whipped/creamed honey spread? Is there any difference for burn treatment? Thank you. I have a video in YouTube about the remarkable recovery of a 3rd degree burn individual who recovered from severe burns from a gas explosion. See the remarkable recovery after treatment with jungle honey within 1 week. I burned my hand - at the base of the thumb last night on the stove. I did not know that Jeannie had turned on a burner and I tried to use it by taking a pan off of it and putting my pan on. To make the story shorter, I burned my hand really really badly. It was VERY painful and about the size of a walnut. I could not find anything in the house to doctor it but then I remembered reading about honey being good for diabetic ulcers - as good or better than any medication that is used. I smeared honey on my burn and pain started to subside and in about 15 minutes there was just soreness and some redness but it did NOT blister which I was sure it was going to do when I first burned it. I expected to see a blister the size of a golf ball form. No blistering and today just a little redness but skin is intact and my hand is fully functional. I am a believer in the use of honey. I looked up some information after the fact and found this link https://www.benefits-of-honey.com/burn-treatment.html. Sanjay, we are unable to tell how extensive or serious the burn or scalding is. Your daughter may need special medical treatment, so please do consult your medical doctor. Honey is most effective when the burn or scalding just occurred. It is not a good idea to post your question here and wait for an answer, especially if she requires immediate medical attention. My 6 year old daughter has got extensive mouth burn due to accidental intake of hot water. Should I prefer honey as an ointment to cure this? Please suggest. I also found relief of a burn using raw-wild natural pure strained honey. I was truly amazed at how fast it stopped the stinging, burning pain. It was only a matter of a few minutes when it quit hurting. I'm going to throw out the other ointments and salves and keep a jar of honey in my home. Used it on my fingers that I burned on the stove top. It worked great and immediately relieved the pain. My son is a welder and got some fairly bad burns on his fore arm, of course as his mom I told home what he should do. He tried my advice and after 1 day called with great results. I burned my wrist when hot grease splashed out of the pan. I rinsed it off right away in cold water, then applied raw honey. The pain went away immediately and 3 weeks later you can barely see where the burn was. Honey is miracle stuff! I always use it for minor burns and would not hesitate for a severe burn. I have experienced the same instant pain relief when honey is applied. Within a few minutes, there is no redness or even tenderness and no blisters! I read that honey has been used in burn treatment centers, I'm certain it can heal your insides as well if it works such wonders on a burn! Honey is an excellent burn treatment. Taking bread out of the oven one day, the bread pan slipped and landed on my left wrist. I peeled it off of my skin and noticed 1st and 2nd degree burns. Running cold water on the burn was very painful, so I thought this is the time to test honey on the burn. Upon application of the honey the pain immediately stopped. I piled honey on the 2 inch burn and wrapped my wrist with gauze and left it there for 5 days. When I removed the gauze, there was no evidence of my ever having burn that area. Sitting around the campfire the other day, an ember popped and landed on my friend's throat. She jumped about for a while, and said it was gone...no harm done. I saw the redness starting on her skin and went and got my jar of honey. She protested a bit, but as I smeared the honey on her skin, she felt immediate relief. No blisters appeared, and a couple hours later, she was still pain-free and the redness of the burns had disappeared. Gotta LOVE just plain, pure HONEY, Honey! Don't leave home without it. I was bitten by a mosquito. I did not have any medicine to stop ichting. But I had a little bag of honey in my purse. I used it and forgot I was ichting at all. On another ocasion, I got badly burned. Again I had no medicine with me for that. I put my hand inside of a bow with honey in it. I kept there for good two hours. For my surprise, the pain went away, and I never had burning marks on my skin. I also use honey to heal any cuts and or infection. After mowing my lawn I accidently touch the hot part of the machine on my wrist got a burn....after the blister popped it didn't seem to be healing applying antibiotic ointment and it seemed like it was getting infected and I remember reading somewhere about honey and its healing properties so I put a dab of it on the burn and in a few days it healed quickly and there's no scar left! End of "No. 1 Home Burn Treatment". Back to "Honey as Home Remedy".